People hate their smile for different reasons, whether it is crooked, misshapen or chipped teeth, discoloration, or gaps, but there is one quick way to fix each of these complaints in one procedure—porcelain veneers. Porcelain veneers are thin wafers of porcelain that are bonded to the front of a tooth. If done correctly, your smile then becomes a work of art—each tooth masterfully shaped and colored to your desired look. No bulky teeth. No fake-looking smile. Not just any dentist can create a beautiful, natural look because it takes art. It takes a dentist like Dr. Cummiskey, who has dedicated himself to extensive additional training with the American Academy of Cosmetic Dentistry, to be able to create smiles with such confidence that he offer a beautiful smile guarantee. He will make sure you love it during each of the stages of your new smile before it’s permanently bonded on or he’ll work with the ceramist to fix it until you do. At your first visit with Dr. Cummiskey, he will listen to what you want your smile to look like. Do you want a more youthful smile, maybe a more sophisticated one? Taking into account your facial shape and complexion with your hair color, he will help you design a smile that you will be happy with. He will then prepare a wax-up, a model of your new smile, so you can see it in a physical way and make sure the smile you desire is the same as what he has perceived. 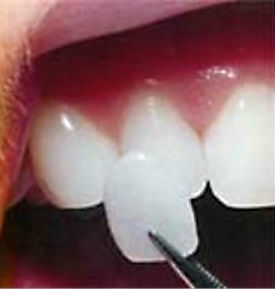 After making sure you are on the same page, your teeth are prepared for the veneers. They may need to be shaved a small amount to create space for the new veneer. When this shaving is done, it’s a minimal amount, about the thickness of a fingernail. After an impression is taken, a provisional set of veneers with an example of your new smile is prepared and you test it out, wearing it home to see what you and those around you think about the look before your permanent veneers are bonded on. Any changes you want can be communicated to Dr. Cummiskey. A short time after, when your porcelain veneers return from a quality ceramist, they are permanently bonded on and, if done correctly, these teeth are stronger and more stain-resistant than natural teeth and you have something to smile about. There are different porcelain veneer options. Dr. Cummiskey can consult with you and help you decide what will be best and discuss costs. If you are interested in porcelain veneers, we invite you to schedule an appointment. Give us a call or click here to request an appointment. If you are wondering if you are a candidate for porcelain veneers, we can see you for a complimentary consultation. Dr. Cummiskey will meet with you for 5-10 minutes and tell you if he thinks this will work for you and you can decide if you’d then like an examination. To read more about Dr. Cummiskey’s Beautiful Smile Guarantee, click here.